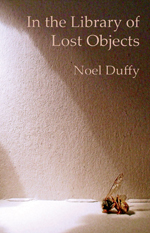 In the Library of Lost Objects has been selected by the poet and judge Peter Sirr to go on to the shortlist of 4 for the Strong Award for the best first collection by an Irish poet. In the Library of Lost Objects was shortlisted for the 2010 Patrick Kavanagh Poetry Prize for the best unpublished first collection by an Irish author, receiving a special commendation from the judge, Brian Lynch. It contains a selection of poems which won the START Chapbook Prize and others which won the The Firewords Poetry Award. Between these covers you will find more prize winners and poems that have appeared in literary magazines and anthologies and have been broadcast on RTÉ Radio 1. In this collection, the poet’s scientific background is brought to bear on his poetry as interesting connections are made in a universe where the legacies of the past pervade the present… Nature is present in many guises: awe- inspiring, hideous, watchful and yet, at the same time, non-seeing… This collection isn’t only about lost objects, but also about lost feelings and human frailty in the face of constant change. Duffy understands poetry, it’s his tradition; he obviously loves it and has curatorial urge to see it thrive. He exhibits only the good stuff, the best work, there’s no small talk, no gimmicks, nothing insincere, he just gets down to the heart of things and gives us poems that matter. Here you will find the human mysteries of knowledge, endurance, memory, fate, absence, inseparable from the vivid images in which they are held: stone, bee, daisy, book, ring, dragonfly, photograph. Form and content seem perfectly fitted together, but it is not a comfortable fit. Loss is integral to all the poems: they all seem written in ‘The Silence After’. But the silence is also the silence before: before ‘the distant, steady thunder of the lock’; before the empty hive. And it is also the silence in between; the silence of the ‘morning of remission’, of ‘the silent hours till I give up / the ghost…’. This silence, this space the poems create around their content, gives them their great authority. Noel Duffy was born in Dublin in 1971 and studied Experimental Physics at Trinity College, Dublin, before turning his hand to writing. He co-edited (with Theo Dorgan) Watching the River Flow: A Century in Irish Poetry (Poetry Ireland, 1999) and was the winner in 2003 of the START Chapbook Prize for Poetry for his collection, The Silence After. His work has appeared widely in Ireland, as well as in the UK, the US, Belgium and South Africa. More recently he was the winner of the Firewords Poetry Award and has been a recipient of an Arts Council of Ireland Bursary for Literature. Noel holds an MA in Writing from the National University of Ireland, Galway, and has taught creative writing there and at the Irish Writers’ Centre, Dublin, and scriptwriting at the Dublin Business School, Film and Media Department. He currently lives in Dublin.